In this blog post, I explore how one community is discovering its sense of place through re-imagining its own ‘mythic’ story. Through this story we are reminded that every place is both a journey – and a homecoming. 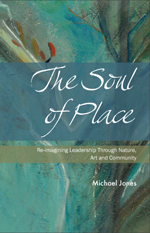 This blog post has been co-authored with colleague Daphne Mainprize with whom I have had the pleasure to serve as co-chair on the Mariposa Roundtable which has been formed to explore our own community story of place. The Mariposa Roundtable evolved from the “2000 and Beyond” strategic study, which was developed to ensure the long-term sustainability of the Stephen Leacock Museum National Historic Site. A group of community volunteers came together in 2012, along with the Mayor of Orillia to revisit the material in the original study and to re-imagine the work that had been done with a eye to the future. The evolution of the roundtable over the past two years has had its own mythic story. Ever changing and moving in unison, the roundtable members have collaboratively envisioned the stories of Mariposa, the fabled place brought to life by Stephen Leacock in Sunshine Sketches of a Little Town. for Leacock, Mariposa defined the “spirit of place.” As he wrote in his Preface to Sunshine Sketches. “The inspiration of this book, -a land of hope and sunshine where little towns spread their square streets and their trim maple trees beside placid lakes almost within the echo of the primeval forest, -is large enough.” Mariposa – the “universal” inspiration of home. The Mariposa Roundtable has re-imagined the way we engage the community through telling our stories and envisioning the creative tourism potential and the economic benefits that may come from cresting a new narrative for the future. By “occupying the space in between” the Mariposa Roundtable has evolved organically, outside traditional structures and therefore has created opportunities for community engagement and inspiration that speaks to the need to “re-imagine our mythic storyline” together. Indeed, it may be that the Mariposa Roundtable has manifested a newly emerging and unique framework that fills a critical need for bringing forth the voice of community and is a template for re-engagement, collaboration and forward thinking. When we think of community in its mythic context, mapping its many features with language that is beautiful and evocative rather than utilitarian, we also create a matrix that includes other stories and myths both in adjacent communities as well as other localities and regions around the world. They become the destinations for pilgrimages as we discover the transformative potential of joining these myths together. What would unfold, for example, if the mythic story of Mariposa that enlivened our community became the source of shared experiences through global pilgrimages and conversations? In mapping the mythic story, we take up the call to be anthropologists uncovering other untold stories, forgotten artifacts, mysterious images and hidden meanings. We polish and burnish them so they may shine again and serve as the foundation of something we may become immersed in and from which everyone can learn. Very often these stories of enchantment, like Mariposa, are hiding in plain sight. When we relive them, they help us reconnect to our own mythic inheritance. They are also stories of belonging, stories that are key to discovering what it means and how it feels to be connected to each other in a place-based world. We live in a world that is increasingly interconnected and interdependent. At the same time, it is more fragmented and polarized than ever before. In this turbulence it may be our mythic stories of place that serve as the bridge from our past to our future. As we transition from an industrial age to a global society based on living and dynamic systems some communities may “get lost” in the push for residential wastelands and big box stores. How do we ensure that our communities re-imagine and explore the stories that feel most alive to them and by doing so find their own core mythic identity and and sense of integrity? The evolution of the Mariposa Roundtable recognizes the fundamental need to shift the parameters of what has been traditionally expected when marketing, promoting and branding (anything), but in our case, Mariposa. Mariposa is about tomorrow…where the future continues to lie in recognizing human frailty, the blend of laughter and tears…the longing for adventure and the safety of home…where humour, laughter and eccentricity are accepted. The lure of Mariposa is “hope” for the future and the universal desire for “home.” The deeper messages of Mariposa is an opportunity for communities to explore their stories and in doing so begin a collective transformation ….Mariposa starts here! This entry was posted in Community Stories and tagged belonging, homecoming, mythic narratives, neighbourhoods. Bookmark the permalink.